Steel, Leather Lacing, Naturally-acquired Rust Patina, Hand-brushed Penetrol Oil / Base Only - Glass Top NOT included in price. Glass sizes cut to order at additional cost. 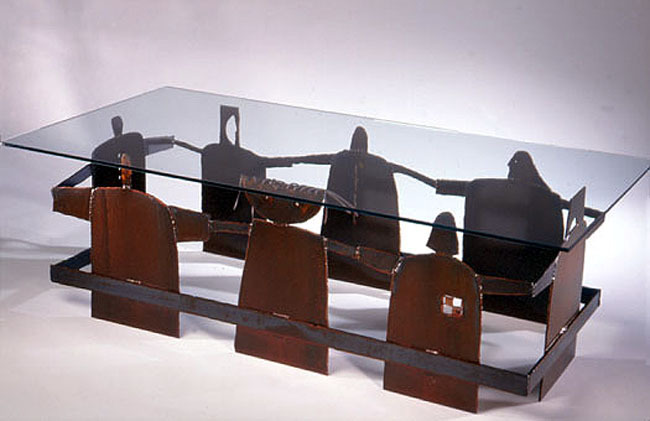 Whimsical design brings personality to this artfully constructed contemporary, steel coffee table featuring a group of figures holding hands Designed so glass top rests on top of base frame. I start out by hand-cutting individual pieces from heavy steel plate using my plasma cutter. Then I grind the rough edges and assemble the pieces together using my tig welder. The fabricated piece is then cleaned with salt & vinegar to start the metal oxidation process, and then placed outside exposed to the elements to develop its unique, naturally-acquired rust patina. After several days of oxidation, I wash and clean the piece with water, let it dry, and then hand-brush two coats of Penetrol - a metal sealing oil that dries hard to a rich glossy finish. I end the process by embellishing the two figures with leather lacing. Contact us Now for a price quote on custom sizes or shapes. United States: Contact us for rates. E-mail us for delivery rates to addresses outside of continental U.S. DELIVERY AND INSTALLATION SERVICES AVAILABLE: Sculpture delivery and installation services provided by studio personnel.